Albumen print on paper (4½ x 6 in., oval), mounted on card. Contemporary manuscript caption on mount. 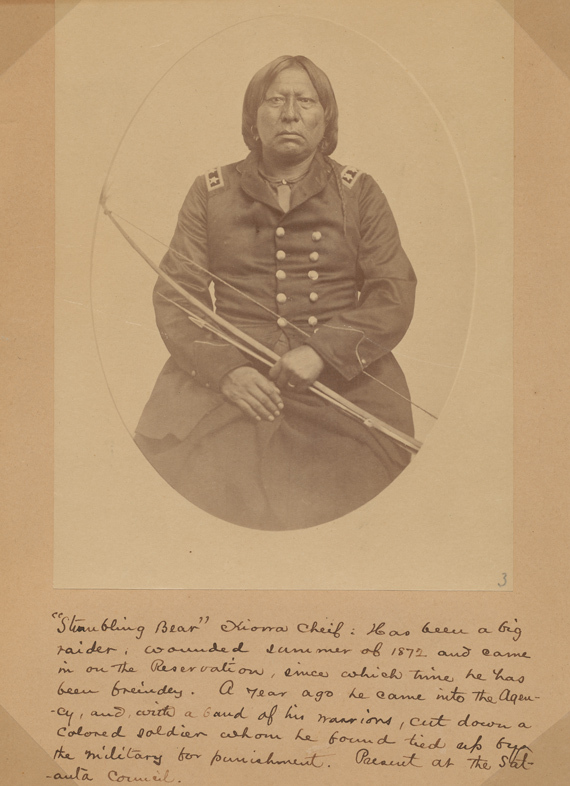 The Kiowa chief Stumbling Bear (Setimkia) was an influential war chief and raider in the Southern Plains. In 1864 he successfully defended a Kiowa camp from a cavalry attack led by Colonel Christopher (Kit) Carson. Stumbling Bear was present at the signing of the Medicine Lodge Treaty in 1867, and he became a leading advocate of peace with the whites. In 1872, he went to Washington D.C., with a delegation of Kiowa chiefs who sought peace. In 1876, the federal government built a home for Stumbling Bear on the Kiowa reservation at Fort Sill. When he died in 1903, he was the last surviving Kiowa chief from the days of raiding the Southern Plains.